If you are the only turtle living in someone’s yard, where are you going to find a mate? Asphalt and lawns are fine for moving people around, but they create barriers for wildlife. Fragmentation of our natural areas has a lot to do with why box turtle sightings are an increasingly rare occurrence in the suburbs. Our parks, only some of which are large enough or undisturbed enough to nurture biodiversity, make up a small percentage of the land in Northern Virginia. It is up to us to connect those natural areas into wildlife corridors by using our own yards. By lining our properties with hedges, we can create pathways for turtles and other wildlife to navigate the landscape. Ideally such pathways would be uninterrupted, but even creating a series of islands is effective. Not only can native plants provide shelter, but the fruits, berries, and seeds they produce will attract songbirds to liven up our landscapes. Have you ever noticed that birds congregate on properties that have thickets? Creating a hedge is very simple. 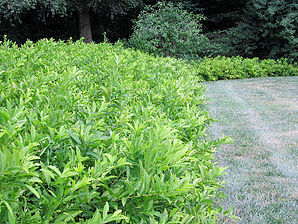 Start by planting two or three native shrubs where you now have lawn, allowing dead leaves to create a ground layer. Add more shrubs and trees as your time and energy allow – the wider the corridor, the better. Many suggestions for suitable plants of various heights can be found on this page of the Plant NOVA Natives website. Hedges, which can look relaxed and natural like a hedgerow, or clipped and formal, provide the additional benefits of capturing stormwater and enhancing privacy. By the way: if you ever stop your car to help a turtle cross the road, be sure to deliver it to the side where it was heading, and no further. 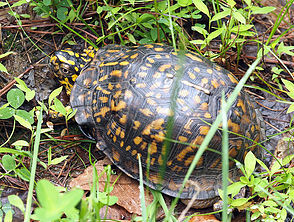 Box turtles are territorial and will not survive if you move them any distance.